Celebrate the sun in a few ways by adding this Rome Cast Iron Armillary Sundial with Sunburst to your landscaping. Armillaries were used for centuries as celestial globes, with rings corresponding to the meridians and parallels on a modern globe, and this unit perfectly continues this tradition. Robust, intersecting bands on this cast iron item create the orb shape, while Roman numerals on the horizontal arc form a timepiece. The brass color of the numerals and sunburst accents contrasts the gray frame, and a matching, 20" long arrow completes the unit. This arrow acts as a gnomon, casting its shadow over the numerals to indicate time. For an accurate reading, face this item celestial north, which is simple to do thanks to the cardinal directions on the base of the piece. 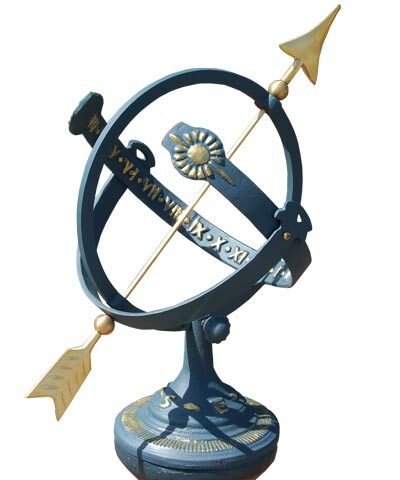 Adjust the angle of the gnomon to match your latitude for even more precision, and rest the armillary on a pedestal (not included) or other level surface. The cast iron body of this item ensures durability, and its gray and brass hues offer a classic look. Highlight your appreciation of the sun with this Cast Iron Armillary Sundial with Sunburst. Assembly required. Rome Cast Iron Roman Pedestal, Antique Gray, 20"